Stumbling Over Chaos :: Finally Friday – whew! Ok, I added this contest sort of late yesterday, so it will be a repeat for some of you: Cara is having a haiku contest – leave a haiku containing the word “sock” plus three other special words (listed in her post) in her comments before September 23, 11:59 pm EDT. Six winners will receive sock yarn and one of the coveted orange Chibis! Duchess is having a ballband dishcloth contest. There are lots of ways to participate! Registration to participate closes September 27. Julia is having a contest about your experiences knitting for men – part of the prize is Alice Starmore’s Sweaters for Men! Leave her a comment by 5 pm PST, September 25. The final SRP standings are out! Congrats to Tiffany, who read the most by number of books and by number of pages. I came in third in number of books and fourth in number of pages. Big thanks to Kat for a fun summer contest/program! Wednesday night, Deb and Jeanne came over to knit and meet Mayhem. 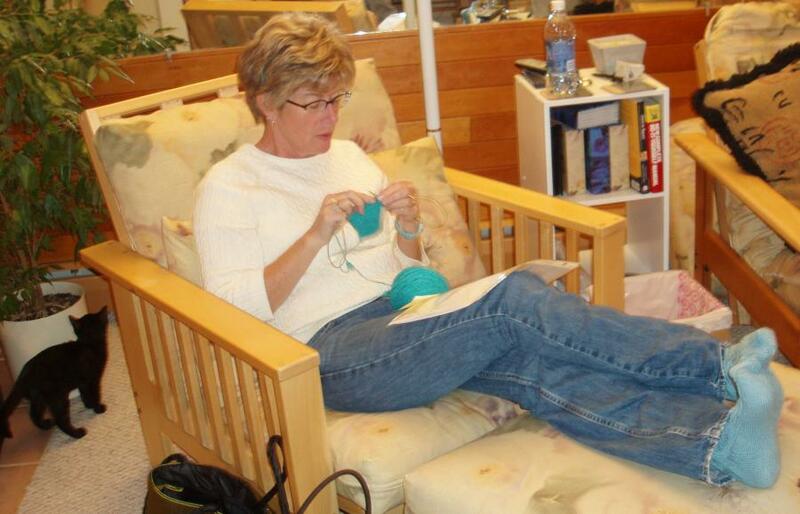 Deb is so focused because she’s knitting Eunny’s new sock pattern, Bayerische. You should go over and see the amazing work Deb did on setting up the charts for herself – while having a migraine. Wow. I’m not sure what Jeanne is focused on. Maybe wishing she was wearing her warm and toasty Lara? Anyway, check out the amazing sock yarn she dyed! Edit: I was knitting my MagKnits pattern – hence no pictures! 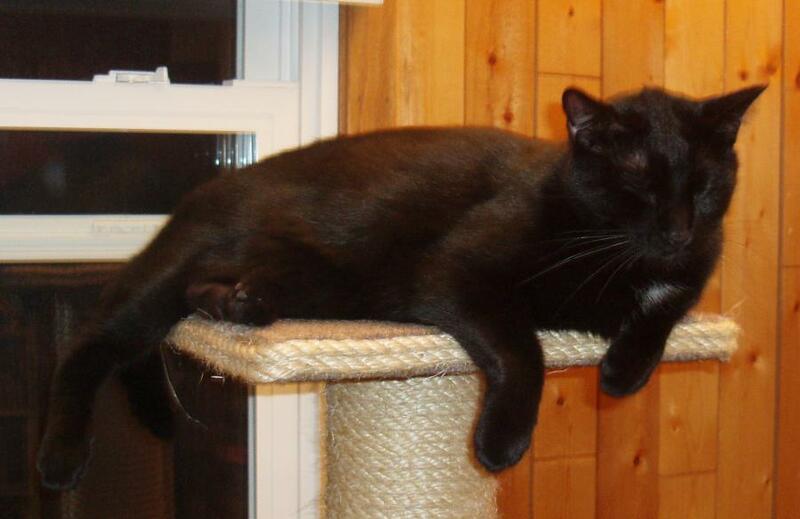 Chaos hung out and kept an eye on all of us… although he seems to be taking a break in this picture. Posted by Chris on Friday, September 22nd, 2006, at 6:56 am, and filed under Contests, Knitting, Those Cats. what about a gift for the gorgeous Chaos? Kitten warming! How cute. Everyone looks like they had such fun! The salient question: how attracted to yarn is May? Amber’s grown up cat has a toy similar to May’s new one, but it has cardboard in the center that you sprinkle with catnip. I guess she doesn’t use it much anymore except when there are visitors and then she shows off with it, LOL! And just what were YOU knitting? Love the comparison shots of the cat tree! Is Chaos’ tummy doing better? That purple and green sock yarn is crazy awesome. Mayhem is so cute. 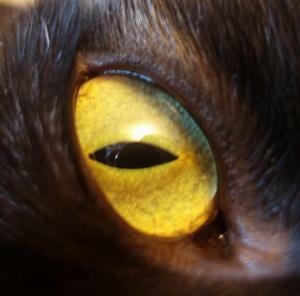 I love the amber eyes. So, how’s the little Missy around strangers? Hey, what did you knit last night?! Hope Chaos is doing better. He sure doesn’t “look” stressed up there on that perch. Yeah…where are YOU? I think Mayhem is growing FAST! When will the mystery object be revealed? Soon she’ll be as big as Chaos, especially since he’s on a diet! Love the pictures of Chaos and May, you can see how much smaller she is in that picture. Is Chaos feeling better? We had that same blue cat toy at our house, and you’re so right. At about 9 months, the magic’s gone. I love the “kitten warming presents”.. how cute. We have one of those round ball things too, but ours has a cardboard scratch pad in the bottom that you can sprinkle with catnip and my cats still love it at 4 years old. That kitten learned from Chaos – get in as many pictures as you can! 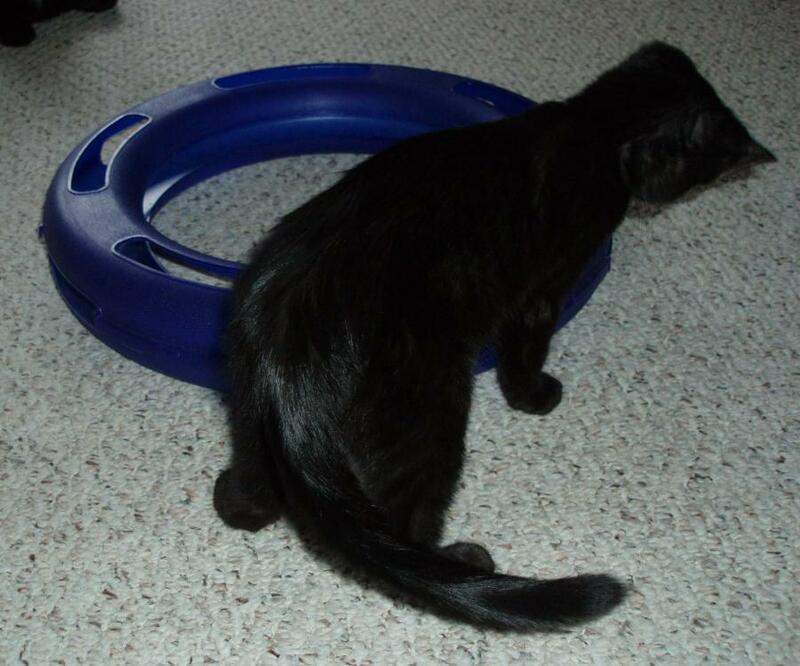 Harley will still occasionally play with with the ball-in-a-ring toy, but not like she did when she was younger. She was more than a year old when I got her, but was still fascinated — living in the wild as she had, there were no toys! They really look like they’re getting along fine. Hope Chaos’s tummy is calming down…. Always so serious aren’t we!! I just love the linky-linkiness of your posts – sure does take me all over the internets!!! 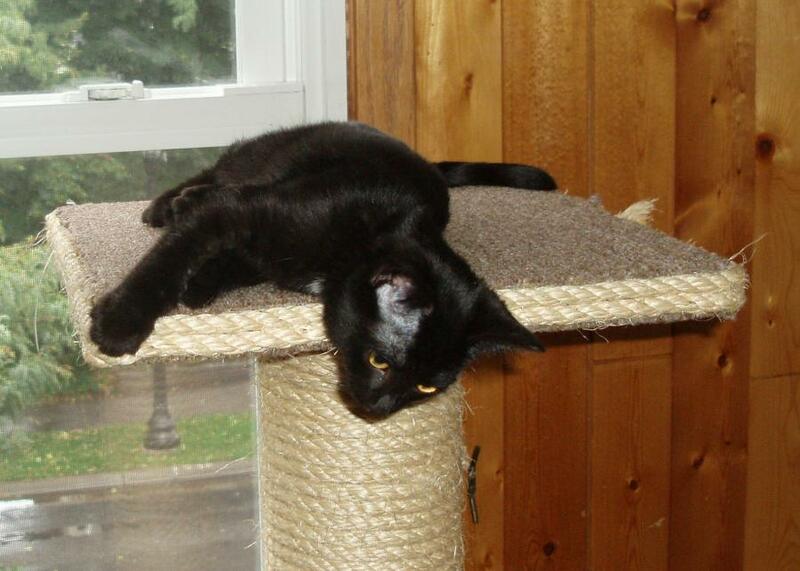 **giggle on the Kitten Warming party** ;o) Looks like you all, kitties included, had a great time! Thanks for the link to those beautiful socks – I found some lace tips there too! You’re getting us all anxious to see your MagKnits entry! That’s a cool pink mouse. Put a bell on it so its fate isn’t the same as SRM’s. Man those Eunny socks are crazy. My head hurts just thinking about them! Looks like a fun group knit! The kitten warming gifts are a great idea! Looks like you had a great kitty/knitty night. Do they have kitten registries at PetWorld? I’m dizzy just thinking about it May. How is Chaos doing today, any better? My nine-year old laughed at Chaos’s comment about pink being May’s color. 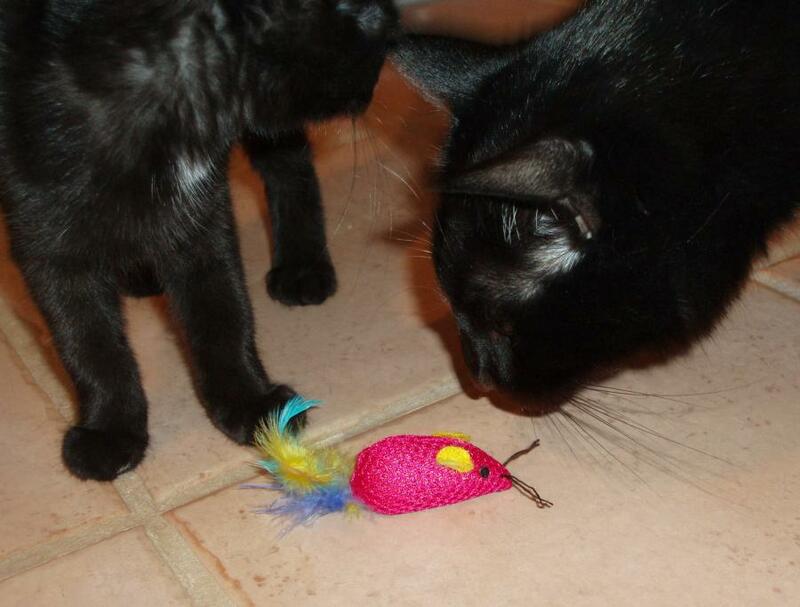 She knew it was all about scamming the mousie from the kitteh. Aww – I think we gave away that particular kitten toy too. How is Chaos now? Poor thing! Great pictures, I liked seeing everyone/kitty. I hope Chaos becomes less stressed soon. Nice compare and contrast cat pix! I hope Chaos is feeling a bit better. I saw Deb’s work! Amazing girl. How awesome is Jeanne’s sock yarn I love it! Hope Chaos is feeling better! you’re amazingly good at keeping track of the contests! I say 6 months for the kitty loan. My mother bought the same toy for her cats and they got bored with it within a month. Oh well. We got that kitty loan thing for a kitten years ago – she played with it for five minutes then only ever used it to sleep on. Sigh. You crack me up with your contest announcements! May is ‘dorable.